Palmyra Family Dentistry offers our patients both full and partial dentures to improve their smile and the function of their teeth! Dentures are probably the most common way to replace missing teeth worldwide, especially when a patient is missing many teeth. Both full and partial dentures are comfortable, removable prosthetics that can be worn relatively easily by the dental patient. In addition, dentures are the most affordable replacement for missing teeth, especially when compared to other alternatives such as dental fixed bridgework, dental implants, or implant-supported restorations. However, dental implant-supported restorations (also known as mini dental implants) are by far your best alternative for a properly functional and beautiful smile. The Palmyra Family Dentistry team provides complete full and partial dentures for patients, including the fabrication of new, custom-fitted dentures offering high function and beautiful esthetics. 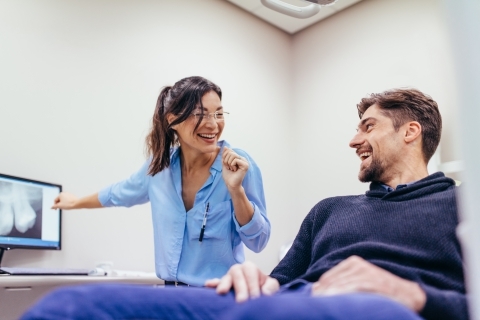 If any teeth need to be removed, our highly trained dentists can also perform tooth extractions for you as quickly and comfortably as possible. Many of our patients opt for sedation or anesthesia during this process so that they do not feel a thing or even remember the procedure at all. At our Palmyra dental clinic, we also offer denture repairs for our patients. In addition, loose dentures can be stabilized with fixed dental implants, eliminating worries that your denture may slip out of place. If you have any questions about denture options and possibilities, please feel free to call and ask any one of our dentists or receptionists at Palmyra Family Dentistry. Get ready to smile!